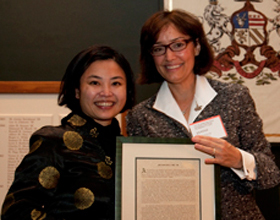 Belinda Chiu '98 (left) was presented the Young Alumni Award by Janine Avner '80, Alumni Council president, at the council meeting in December 2009. After graduating from Needham High School in Massachusetts, you weren't exactly looking north to attend college. Not, that is, until your first mentor in life, attorney Ed Dailey '68, encouraged you to consider Dartmouth, steering you away from any crimson influence your older sister might have had. You visited Hanover one rainy day and were impressed to find the students actually seemed ... happy! You soon became one of those blissful students, and enthusiastically worked to enhance the richness of the College. You dove right into your passion for diversity, assuming leadership roles on the Pan Asian Council and Interracial Concerns Committee; as president and activities chair of the Dartmouth Asian Organization; and as founding member of the Chinese Dance Troupe. You worked as a Career Services intern, as a Daniel Webster Legal Society intern, as a research assistant, and with the Tucker Foundation for three years. This was rounded out by your involvement in the Golden Key National Honor Society, Phoenix Senior Society, Government Department Student Steering Committee, Student Activities board of trustees, and with Admissions tours. You also found time to excel in the classroom, where you earned three academic citations. While you entered Dartmouth resolved to become a lawyer, your time at Career Services and with mentor Susan DeBevoise Wright inspired you to redirect you toward public service. As a result of your hard work and fervor, you were named a Truman Scholar national finalist and winner of the Morrell Goldberg Memorial Prize, given for administrative talent and service. Your path since graduation has been shaped by your spontaneity, continued accomplishment, and constant learning - fired by your determination to create opportunities to help others follow their passions. From the Dove Consulting Group to the Admissions office here at your alma mater, from the Center for Applied Research to the Phelps Stokes Fund, from director of International Programs at Duke University and now with your own consulting firm, you have embraced the opportunity to see the world, challenge yourself, and provide awareness, confidence, and support for others. "How do you include everybody?" you once asked - a question that reveals your altruistic philosophy. During this span, you earned your master's in law and diplomacy from the Fletcher School at Tufts University and a doctorate in education from the Teachers College at Columbia University - in a record-breaking two years! We are thankful that no matter where you are, you always keep Dartmouth at the forefront of your volunteer priorities. Your service has been appreciated on the Alumni Council especially as District Enrollment Directors representative and chair of the Young Alumni Committee; as a perennial Admissions volunteer; as an integral member of the Dartmouth Asian Pacific American Alumni Association; as president-elect of the Dartmouth Club of Piedmont; and, most recently, as an organizer helping to launch the Dartmouth Entrepreneurial Network of North Carolina Club. John D. Rockefeller once said, "I believe that every right implies a responsibility; every opportunity, an obligation; every possession, a duty." Well, Dr. Chiu, this seems to be your credo. And the world - including Dartmouth - is a better place because of it. We thank you for all that you have done and continue to do for the College, and it is a great privilege to present you with the Young Alumni Distinguished Service Award.